The Philippine Eagle (Pithecophaga jefferyi) is one of the world’s rarest, largest and most powerful birds of prey. This magnificent bird is only endemic to the Philippines, thus, in July 1995 under Presidential Proclamation No. 615 it was declared as Philippines National Bird. Unfortunately, the unrelenting deforestation due to logging, continued development and unawareness of many people about the importance of this species has pushed these eagles to the brink of extinction. Scientists estimated that only few hundred pairs of them remain in the wild these days. And if we don’t take action to conserve and safeguard these rare creation, they will be gone forever and our children’s children may not be able to see them anymore. 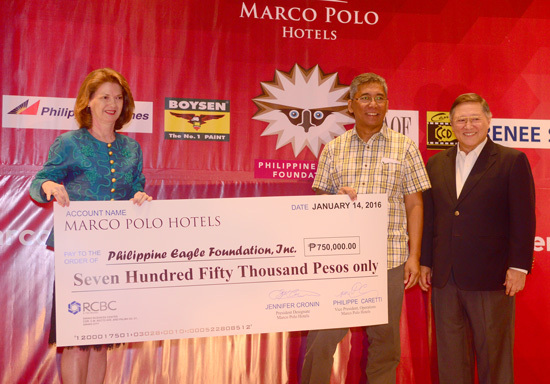 In this light, The Marco Polo Hotels has acted on its share to help and support the conservation efforts to save the monkey-eating eagle by turning over 1 million pesos in cash donation to the Philippine Eagle Foundation. 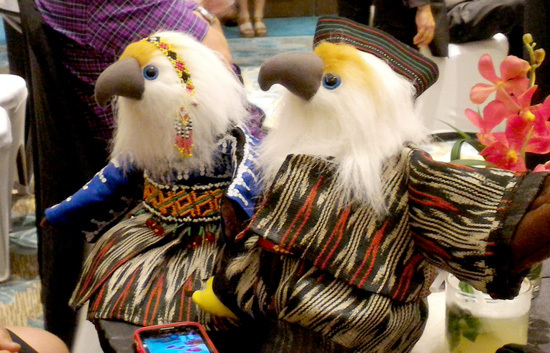 P750,000.00 was the garnered amount from the stuffed eagle toy auction, but towards the end of the turning over ceremony, some kind-hearted and generous sponsors gave in a combined P250,000.00 in cash closing the donation to 1Million Pesos. The idea to bring in together this amount was kind of novel and entertaining. 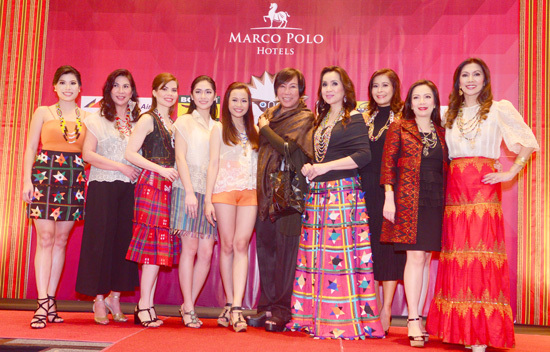 Marco Polo Hotels collaborated with the country’s iconic fashion designer, Renee Salud to dress up adorable little eagle stuffed toys in pairs with his impression of various ethnic and detailed cultural patterns that is uniquely Mindanao. Aren't they lovely? Did you know? Eagles remain monogamous in their entire life. “I am truly grateful and honoured to have contributed to this milestone. I was always fond of birds, and when a friend came up to me last 2013 and presented the idea of dressing up the stuffed toys with my designs, I said yes without batting an eyelash. 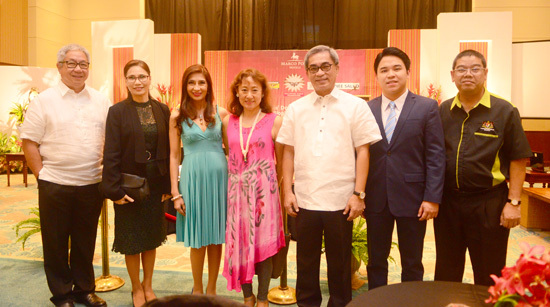 We look forward to have a more fruitful partnership with Marco Polo Hotels in the future for this noble cause”, Renee Salud said. 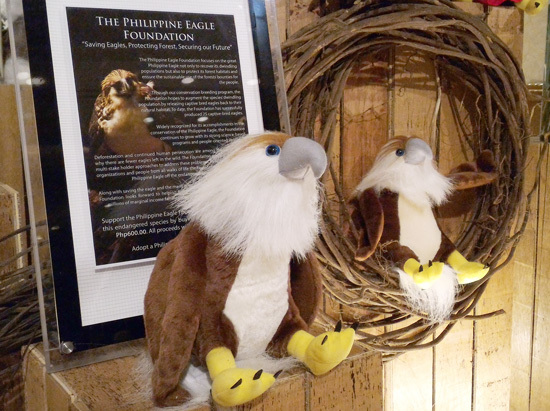 The eagle stuffed toys in Renee Salud were then put to auction amounting to P10,000.00/pair, it initially garnered P750,000.00 but towards the end of the turning over ceremony, few people with big hearts who preferred not to be named, donated a whooping P250,000.00 combined closing the donation to a million. The stuffed toys were presented on a short fashion show which was choreographed by one of the country’s most seasoned Stage Directors, Constantine Siñel. 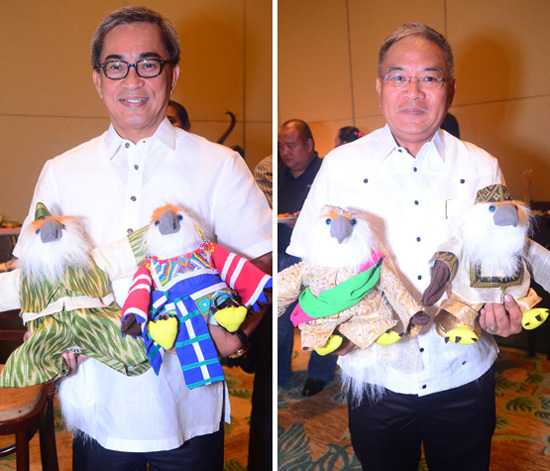 The members of the Hijos de Davao Foundation modeled each of the dressed toy eagles before they were given to the winning bidder. 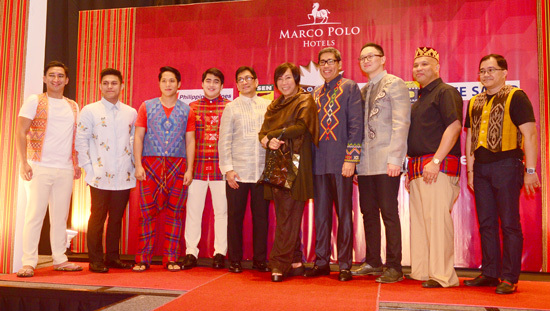 The event was graced by key personalities of Marco Polo Hotel and Philippine Eagle Foundation. 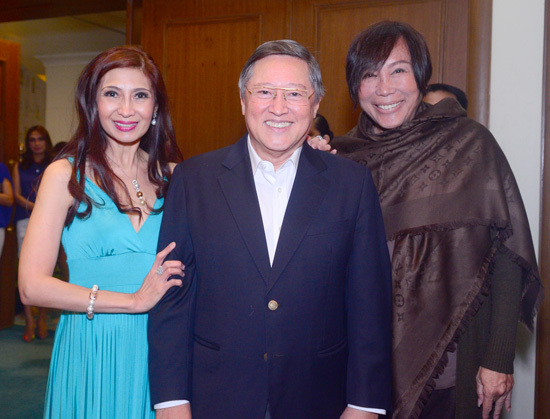 Mr. Carlos G. Dominguez, PEF and Halifax Davao Hotel, Inc. Chairman, the owning company of Marco Polo Davao; Dennis Salvador, PEF Executive Director; Ms. Jennifer Cronin, Marco Polo Hotels President-Designate, friends from the national and local media, tourism partners, blogger friends and major corporate donors. 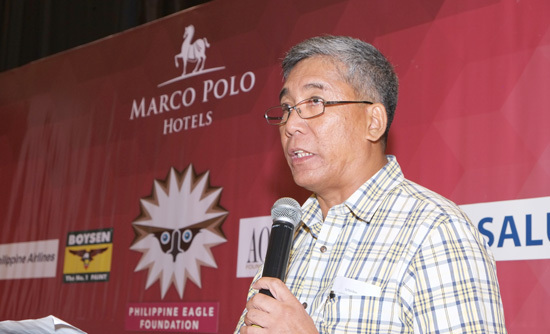 “We deeply appreciate working with the Marco Polo Hotels Group. 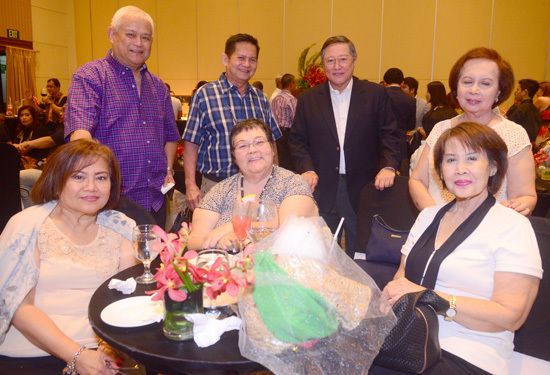 Realizing our many needs, they went out of their way to orchestrate a fund-raising project which engaged both its guests, associates and members of the local community. In doing so, it did not only enhance public awareness about our national bird; but had the entire Marco Polo family embrace the effort. 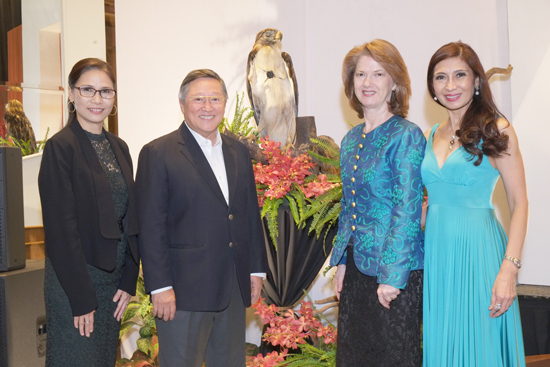 This partnership is a great example of how a Corporate Social Responsibility should be carried out”, says Dennis Salvador, Executive Director of the Philippine Eagle Foundation. The event was capped by the hotel’s culinary highlights; on the spread were Malagos Cheese, carvings of US Angus Rib-Eye, Hot Smoked Salmon Potato Dill with Tomato Salsa, Lump Caviar & Chives and other local delicacies were served as pass-around cocktails. Saving our eagles, protecting our forests and securing our future aren't just the sole endeavor of Marco Polo Hotels, we all can help in our own little way by getting ourselves informed and involved, share the same to those who still doesn’t know. 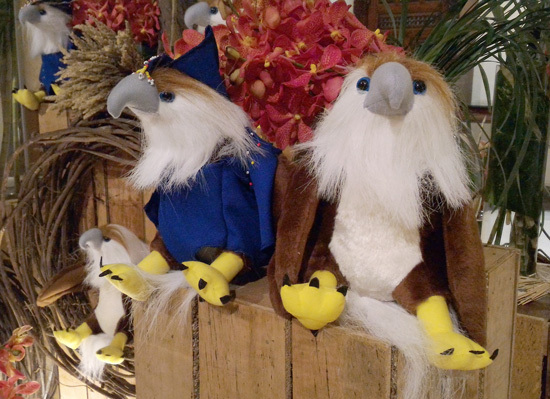 If and when P10,000 is way too steep for you to get started, you can avail of the same stuffed bird minus the Renee Salud get-up for only P600.00 each. Proceeds will go directly to PEF to help in the conservation efforts of our National Bird. You can inquire at Marco Polo Hotel Davao or go directly to Philippine Eagle Foundation website http://www.philippineeaglefoundation.org/ for more the details. We need a home, adopt us and help save the real ones. This is very interesting to know. Wow, almost a million!